I don't know how accurate this is but as you know traditional healing is still very popular despite of all the advanced medication today. I got this tips from my Cella in my mailbox this evening. So here are tips from the Chinese as to how you could lower your cholesterol in your body. 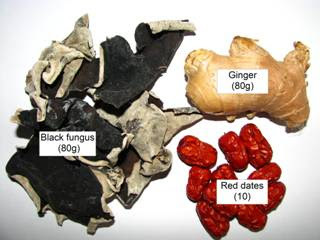 All your cash drawer needs to spend on are things such as 80g black fungus, 80g old ginger and 10 red dates. First, soak the black fungus in water until it is soft then wash it clean. Second, cut the ginger without removing the skin into about 8 slices. Next, remove the seeds from the red dates. Then put all the ingredients into a slow cooker. Add in 8 cups of water into the cooker and cook the mixture for 6 hours using low heat. Lastly, serve. Tips: Prepare the soup in the evening and start cooking before you go to bed. If you start cooking at 9pm the soup should be ready by 6am. How I miss mom's cooking!